Dungeons and Dragons Scenarios This is the place to put all of our D&D adventure type scenarios. Come here when you want to browse user submitted adventures. 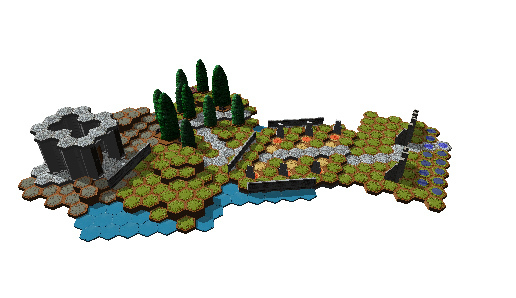 I am setting up one of my old maps tonight and determining if I can adapt it to D&DScape. I will start with the base group of 4 heroes. After that I will add Migol and a couple of squads of the axegrinders. What do you guys think that the magic number of hero points will need to be to make this fun. I will have to come up with some good traps for the artifacts. I may even have to add the vampires. This looks like a Ravenloft scenario more and more each day. Are you going to break it into a series of encounters (The Haunted Path then The Forest of Wolves then The Ruined Castle, or whatever) with breaks in between for the heroes to recuperate, or will it be one big free-for-all? I think that decision will have a major impact on how many points the heroes get/need and how many baddies you add to the map. Your map does look like it will break up very well, but the segments might get pretty crowded with 9 dwarves, 4 heroes and however many baddies running around.